I’ve been developing software professionally for 15 years or so. Like many of today’s enterprise developers much of my career has been spent with object-oriented languages but when I discovered functional programming a few years ago it changed the way I think about code at the most fundamental levels. As such I no longer think about problems in terms of object hierarchies, encapsulation, or and associated behavior. Instead I think in terms of independent functions and the data upon which they operate in order to produce the desired result. To me, the sequence of FARTS describes programming business applications in general quite well regardless of the development paradigm. It just happens that in FP these patterns typically have nice, simple, yet descriptive names such as map or filter. This insight has also led me to see most things we do in OO as unnecessarily complex. We bloat our software with things like DI frameworks and ORMs because OO languages don’t traditionally let us easily change program behavior by simply swapping out functions. And because we’re so concerned with managing state in an OO application we’ve devised design patterns such as flyweight and bridge. WTF is a flyweight, anyway? The very nature of functional programming is such that once it takes hold of you, you start taking certain things for granted. For me, one such thing is pipelining. Pipelining is so named because it lets data flow from one function to another without the need to manage state via imperative code. Pipelining is idiomatic in F# but it’s also possible to achieve a similar effect in C# through method chaining and, by extension, fluent interfaces. Unfortunately, object-orientation’s very nature makes it such that these concepts are architectural patterns and must be designed into the types with which they’re used rather than a natural part of the language. Take LINQ for instance. LINQ is built entirely around these concepts and that’s one of the key reasons why it’s so easy to work with. Imagine trying to work with LINQ in a traditional, imperative manner where we had to declare or reassign variables at every individual step. As much as I’d prefer working in F# all the time the nature of the industry is still such that object-orientation is king. But wouldn’t it be nice to extend these chaining capabilities throughout C# and realize some of the benefits of pipelining across the language? Using the very same techniques that LINQ uses, we can do this quite easily. Let’s start by looking at an existing type that exposes what I consider to be a broken fluent interface. A fluent interface is a specialized, self-referencing form of method chaining where the context is maintained through the chain. 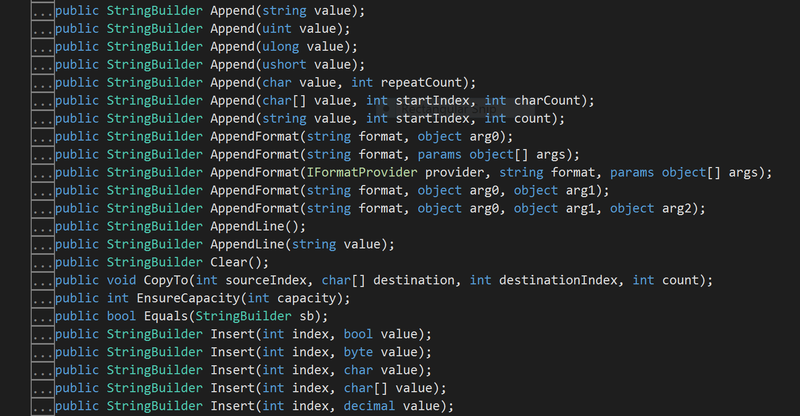 The type I want to look at is one of the oldest classes in the .NET Framework – the StringBuilder. I’ve written about extending the StringBuilder before. This section is derived from that work. StringBuilder is a fantastic class and has served us very well since the earliest days of .NET. One really surprising aspect of the class is that it actually exposes a fluent interface. If you were to inspect its methods you’d see that almost every one returns StringBuilder. This code is a pretty typical example of working with the StringBuilder – even the MSDN examples follow this pattern. By using the fluent interface we can break away from this pattern…or can we? Let’s start refactoring to use the fluent interface and see how far we get before running into trouble. We can easily convert the first three lines. This pattern also exists in the foreach loop so we can take care of that one now, too. Before going any further let’s eliminate one of things that really annoys me when using the StringBuilder. How silly is it that appending a formatted string with a new line requires us to either include the new line in the format string or call AppendLine with no arguments as I’ve done here? Why not combine the methods with an extension method? Let’s start building out an extension class and our first convenience method, AppendFormattedLine. I’d typically host this class in the System.Text namespace to ensure that the extension methods are automatically imported whenever we use the StringBuilder. Here we’ve simply leveraged the StringBuilder’s existing fluent interface to chain the AppendFormat and AppendLine methods. It’s at this point where the StringBuilder’s built-in fluent interface breaks down. Rather than continuing to chain the various methods we’re forced to break out into imperative code to conditionally append a string and also to append strings iteratively. That we have to revert to imperative code for these tasks isn’t particularly surprising given how StringBuilder predates all of the language features that make such chaining feasible. In the early days of C# and .NET we really had but one option for making it work: define a class to wrap the StringBuilder (remember, StringBuilder is sealed so we can’t derive from it) and expose methods that would accept either an interface implementation or a classic delegate. Of course, doing so would require us to expose all of the existing StringBuilder methods so we wouldn’t lose functionality. Defining such a class would be time-consuming and error prone. Today is a different story. Because we now have generics, lambda expressions, and extension methods, it’s trivial to extend the StringBuilder’s functionality with a few higher-order extension methods to provide us with the functionality we desire. Some people question naming the StringBuilder “@this” but I think it’s acceptable because if the extension method were an instance member we’d be referring to the instance as “this” anyway. By using the prefixed identifier we keep things consistent. The method body is simple; if the predicate evaluates to true we invoke AppendLine on the supplied StringBuilder and return the instance via the fluent interface otherwise we just return the supplied StringBuilder. We’ll come back and simplify the chain in a moment but let’s first look at how to include iterative appends in the chain. To accomplish this we’ll use a similar approach by defining another higher-order extension method. Let’s start by defining the method but keeping the imperative approach for the body. In this version we simply invoke the formatting function for each item in the sequence and return the supplied StringBuilder. Let’s refactor the original code to use AppendSequence to see how this looks. This approach allows us the most control over appending each item in the sequence. By defining the behavior through a lambda expression that accepts both the StringBuilder instance and each item we can nest a chain for more complex formatting scenarios. The imperative body certainly works but the purpose of this post is to move from imperative code to more functional code so let’s go back and see what we can do on that front. Let’s look at the function that AppendSequence wants. It’s defined as Func<StringBuilder, T, StringBuilder>. This says that the function must accept a StringBuilder and an instance of T and will return a StringBuilder. This signature can be further generalized to Func<T, U, T> which, not coincidentally, corresponds with the delegate accepted by an existing LINQ function: Aggregate. By combining every append into a single chain we’ve succesfully eliminated the html variable and instead let the original StringBuilder flow through the chain, ultimately returning the constructed string. Before we move on, let’s revisit the AppendLineWhen method. The way it’s written restricts us to conditionally appending a line. If we wanted to conditionally execute any of the other append methods like Append or even AppendSequence we’d have to create additional extension methods. These would, of course each follow the exact pattern so let’s scratch that approach and replace it with one that’s a bit more flexible. You can, of course, further generalize the When extension method to make it apply to any type but I’ll leave that as an exercise for you (hint: make When generic). Now that we’ve seen how powerful fluent interfaces can be by extending the StringBuilder let’s start looking at how we can carry this concept to other part of C#, even across types. One simple thing we can do is work around the language’s statement-centric nature. Functional languages are typically expression-based. That is, everything returns a value – even language features that object-oriented programmers wouldn’t typically associate with return values. For instance, in C# if..else is a statement whereas in F# it’s an expression. So why is this distinction so important? In C#, this distinction is the reason we need both the Action and Func generic delegate types (and their ilk) rather than simply having Func. It’s also the difference between using various concepts inline rather than breaking into an imperative style like we did with the StringBuilder before adding the extension methods. The expression-based approach is much more streamlined and eliminates some of the repetition of the imperative approach. The other benefit is that it also allows us to take advantage of C#’s type inference capabilities. But what about other statements where C# doesn’t have a built-in expression-based alternative? How can we handle those situations? By wrapping them in higher-order functions, of course! I’ve written about a functional version of the using statement before. This section is derived from that work. By wrapping the using statement within a higher-order function we can achieve the same result as replacing if..else with the conditional operator. Let’s define that function as a static method of a class we’ll call Disposable. Note that we’re not defining an extension method because we’re not extending anything. Instead we’re simply defining a function that will handle the lifecycle of an IDisposable instance. This helper function, Disposable.Using accepts two delegates, one to create the IDisposable instance, and another to act upon the IDisposable instance within the using block. To make this type safe we’ve also constrained the TDisposable type parameter to IDisposable rather than using IDisposable directly. Now let’s look at how Disposable.Using can streamline the imperative version. Wait – I thought this was supposed to streamline things but all it looks like we’ve done is add some complexity! Well, we’re not quite done yet but we’ve already achieved two things. First, we’ve combined the variable definition and the assignment. The other thing is that we’ve allowed including using blocks within a method chain. I’ll revisit the later in a bit but first let’s see how we can further simplify this. We could simply refactor the lambda body to a new named method but that seems overkill for something that’s only going to be used here. Think of it this way: would you really define a named method for filtering or sorting a sequence in LINQ? Probably not. What we really want is a more functional way to populate the byte array and return it. Not surprisingly we can borrow a pattern from functional programming to achieve just that. What’s more is that we can define it in such a manner that it’s applicable in more general cases. Let’s take a look at that function which we’ll place in a class called FunctionalExtensions. There, isn’t that better? By introducting Tee we’ve eliminated the lambda block so we can let the byte array flow through the delegate. We could take this even further by extending Stream with a ReadToBuffer method and simply passing that method to Tee but I think the point is clear. Of course, the nature of programming is such that once we have a value we probably want to do something with it. In fact, that’s the whole idea behind pipelining. Why should we stop here? Why not ~~steal~~ borrow yet another idea from the functional world? Notice how similar Map is to Tee. In both cases we’re accepting a value and applying a delegate to that value. Unlike Tee, Map requires two type parameters because it’s going to transform, or Map one value to the result of the function. Let’s go ahead and work this into the method body. Through the magic of higher-order extension methods we’ve managed to transform our original imperative code into a single chain with clearly delineated operations and no variables exposed outside of the code where they’re actually meaningful. I should point out here that C#’s type inference capabilities aren’t quite as powerful as I’d like. In many cases it’s adequate but I’ve found that there are times such as when including NHibernate’s ISession.Get in a chain that I have to be explicit with the type parameters on Map because C# won’t treat the value I’m passing in as object. Before we conclude let’s look how we can leverage one more powerful functional programming concept: partial application. Functional languages often employ a technique called currying which involves converting a multi-parameter function into a chain of functions where each parameter is applied individually. This is in stark contrast with object-oriented languages where the arguments are typically applied simultaneously. Much has been written about currying so I won’t go into much detail about it here (I cover it in more detail in my book ). Instead I want to focus on what currying enables: partial application. In a curried function we can apply the first n parameters which results in a new function we can invoke later. Consider this stereotypical example of a curried add function using F# syntax. Once that function is defined we can invoke addFive supplying only one parameter. Thanks to delegation we can achieve something similar in C# although it’s not nearly as clean as in F# so I recommend using it sparingly. That is, I’d leverage it in simple scenarios but avoid complex partial application chains unless you want your method signatures to start looking like common LISP with parenthesis replaced with angle brackets. That said, let’s see partial application in C# in action by making another change to the BuildSelectBox method. So there you have it – effective pipelining in C#. Pipelining is a powerful technique that lets data flow through the system in a declarative manner. By leveraging higher-order extension methods we can improve upon existing fluent interfaces or provide chaining capabilities throughout C#. We can even use higher-order static methods to convert some of the language’s statements into expressions thus extending the chaining capabilities even further. This approach doesn’t get us to the capabilities of what “true” functional languages like F# provide but it certainly makes working in the often imperative world of C# a bit more bearable to those of us used to having those tools at our disposal. Well it looks like it cut off my tags. I think the last AppendLine closing “option” should actually be “select”. Good catch! I’ve updated the post to reflect the correct tag. Naturally WordPress then messed up my formatting so that turned into quite a job. Flyweight is a relatively uncommon pattern in modern software. In software history it used by a very important pattern because you had kilobytes of RAM in the entire system. You had to store things in as few bytes as possible. The term flyweight is a reference to the boxing weight class that is for fighters that barely weigh 100lbs. The simplest viewing of flyweight is take the string “a” and the string “aaaa” you could easily replace “a” with the bit 1 now instead of 160-640 BITS of memory to store the string “aaaa” you could also store just 1111 as 4 BITS. This pattern still has modern usages, it is frequently used in word processors and as a bedrock in modern languages as a method to do string interning. In a many modern languages if you create the string “aaaa” in your application it will exist exactly once in memory.